There was no rest although perhaps everything I did was recreation. The R&R’s I had in mind were quite different. I had little choice but to walk on Roads and Railway lines for the majority of my experience from New Norfolk to Gretna. You can deduce from my previous posting this wasn’t where I wanted to walk. I had hoped for soft ground directly next to the Derwent River as much as possible. 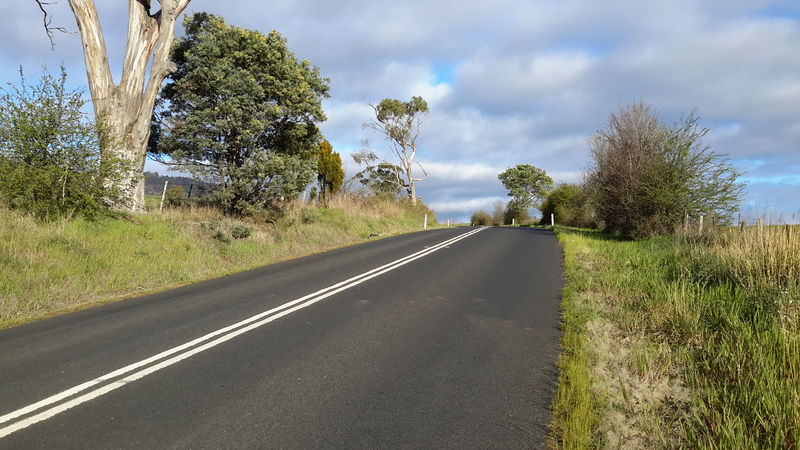 Over the first kilometres west of New Norfolk, the bitumen minor road towards the townships of Plenty and Bushy Park was narrow, and the road verges were tiny or non-existent. To my right, initially house blocks got in the way of my ability to access the river directly. 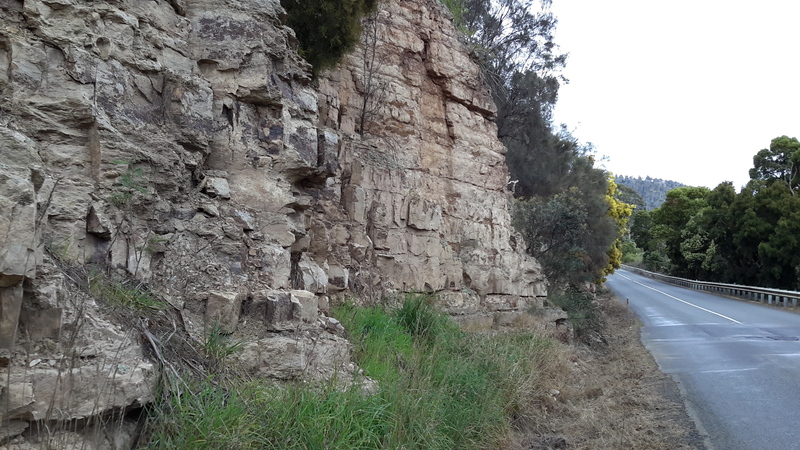 Before long it was metal guard rails, steep drop offs, and weedy tangles which provided a permanent separation. 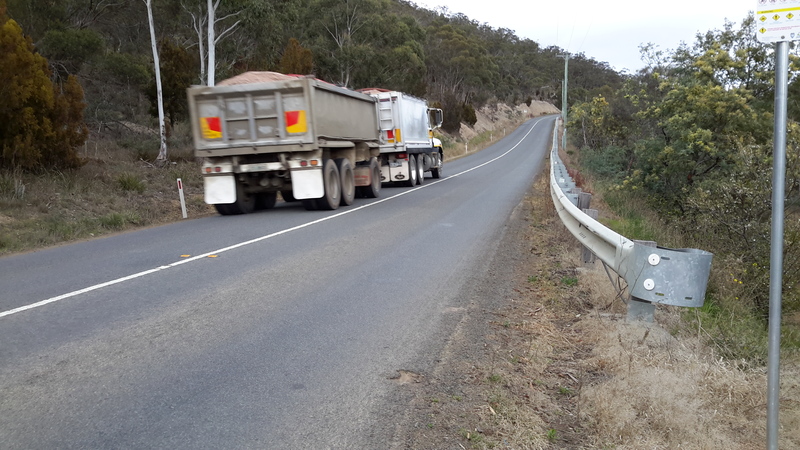 I walked patiently along the road edges changing sides every few minutes to try and get the safest side where I was least likely to be side-swiped by speeding vehicles. Natural gutters with stagnant green slime, or dry mini gulches below the road edges required me to be careful not to tip over when stepping off the road. Apart from not being knocked down by traffic, keeping my balance and not twisting an ankle were paramount concerns. Up and down, across and back. These were the rhythms for many kilometres. In that early period I thought of owners walking their dogs; dogs off a lead. You know – the dog runs ahead then runs back to you then runs off and runs back etc etc. In the end your dog has ‘walked’ two or three times as far as you. Similarly, as I stepped into and climbed out of gutters, the distance I covered seemed to double or triple. 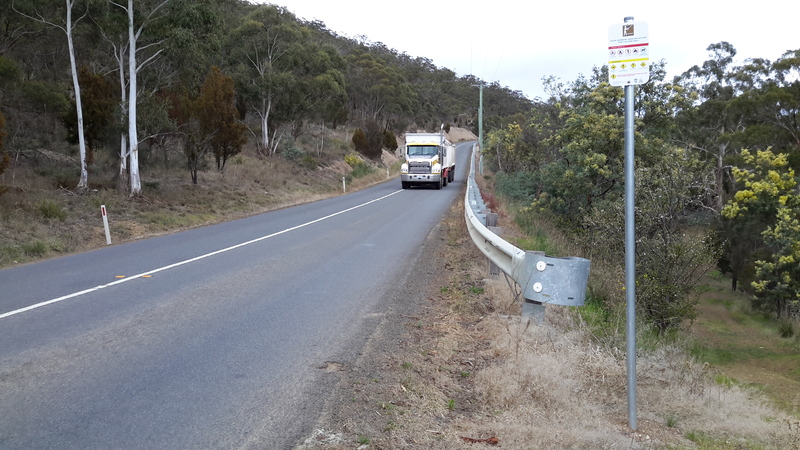 At some points along the road, the guard rail was only a foot / 30 or so centimetres from the road making it very dangerous to be walking such sections. 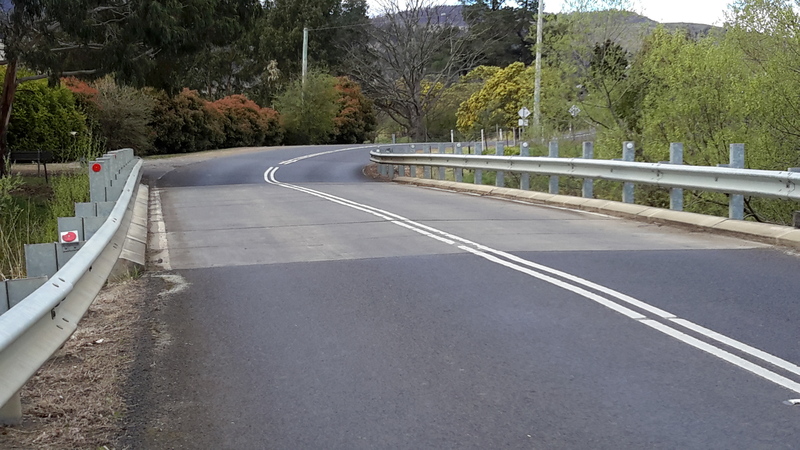 To protect myself, when a stream of cars was approaching I stood with my back to the rail and backpack hanging over towards the river, and held myself tightly against the rail so that the whoosh of cars or their side mirrors wouldn’t catch me. It was on one such section that a couple of cars approached and the front one slowed (with the second doing his best not to ram accidentally into the front car, and crash into me at the same time) and stopped in front of me. The old fellow rolled down the window and asked if I needed a lift. I pointed out he was going in the direction I had walked from and that I was happy to continue in the other direction on foot. Thanks but no thanks. As I moved on, he drove off. Later a couple of people stopped and offered me a lift. I think all offers were genuine. But I accepted none. I stood out on the road as an oddball. People just don’t seem to walk much anymore; certainly not on highways and byways. And road planners show no expectation of pedestrians in their designs. Some of the road surfaces were rather special. 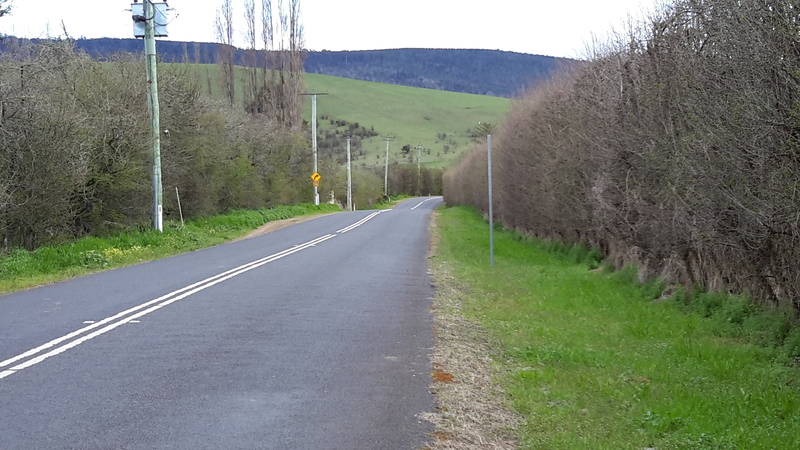 I rather liked the green lichens gradually growing across the black bitumen; I guess there is simply insufficient traffic numbers to wear it down, in this part of the world. 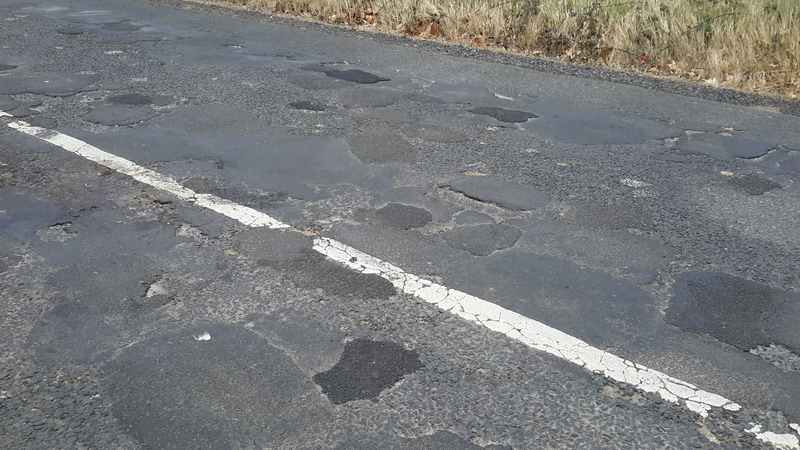 The special patchwork quilt of a road shown above made me wonder whether this bit was at the extremities of two local government areas. 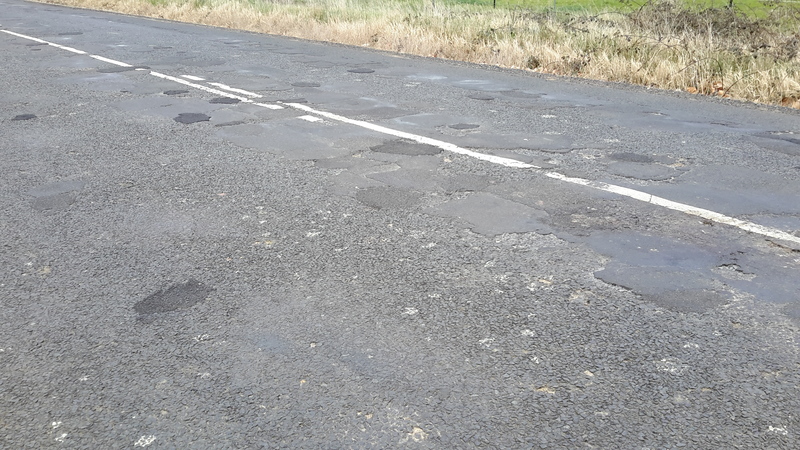 I suspected that both Councils might be thinking that repairing this road was the responsibility of the other. Occasionally I had the bliss of walking on smooth green soft grasses away from potential close contact with traffic. On other occasions the green was deceptive with uneven ground hidden beneath, sometimes containing rabbit scratched holes. Road bridges over rivers provided me with the greatest stress mostly because each was unavoidable and I needed to cross over them. Narrow with only two-lanes and without a pedestrian pathway, these were usually preceded or followed by sharp enough corners so drivers were onto the bridge before they could see what else was on the bridge. I gave the bridge over the Derwent between Bushy Park and Gretna a lot of thought, including considering whether to hitch a ride across it, before taking a deep breath and walking across. The bridge was long with a sweeping corner at one end. 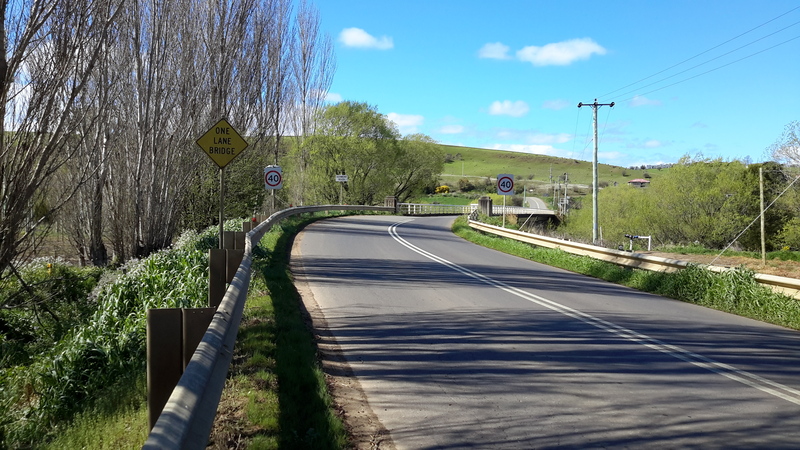 It had only one lane with signs at each end that indicated to drivers they should not enter the bridge if another vehicle was travelling across. 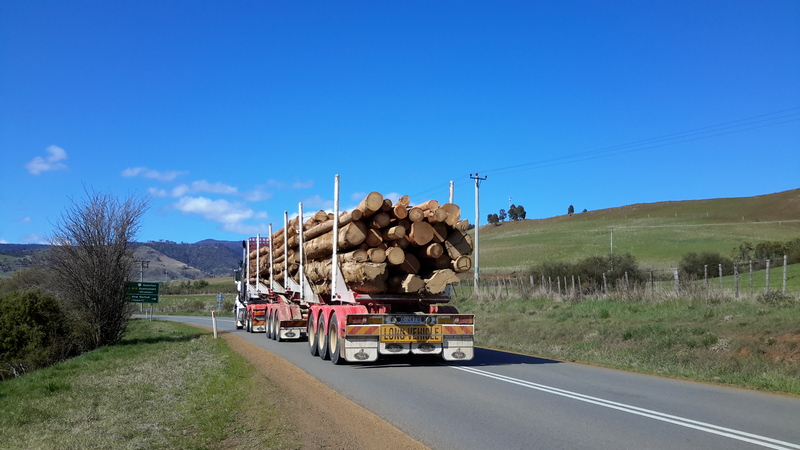 I was aware that massive multiple-trailer log trucks were regularly on the road, as were other heavy and large transports, and of course locals who whizzed their way everywhere at high speed. I wondered how much drivers could be trusted to follow the directions and to slow down. I waited until there was no sound of oncoming traffic from the two distances, and then I hastened across. 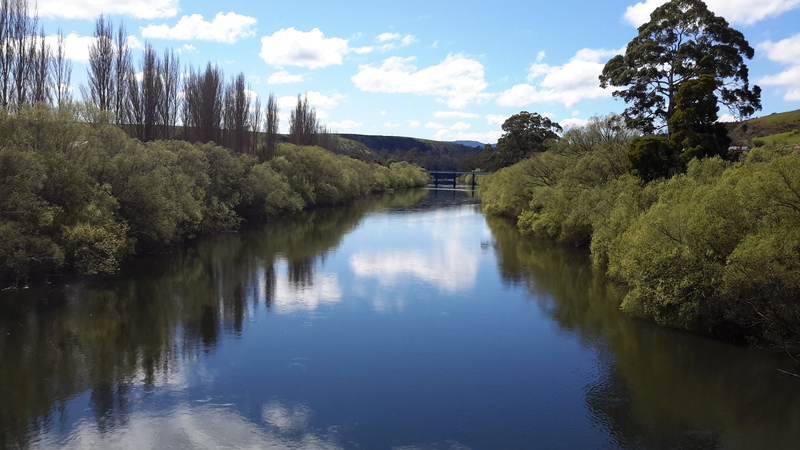 But the view distracted me; it was so wonderful looking up and down the river that I felt compelled to take a photo in both directions. I clicked quickly as a large 4wheel drive flashed onto the bridge. I held myself back against the rail as he sped past glowering all the way. 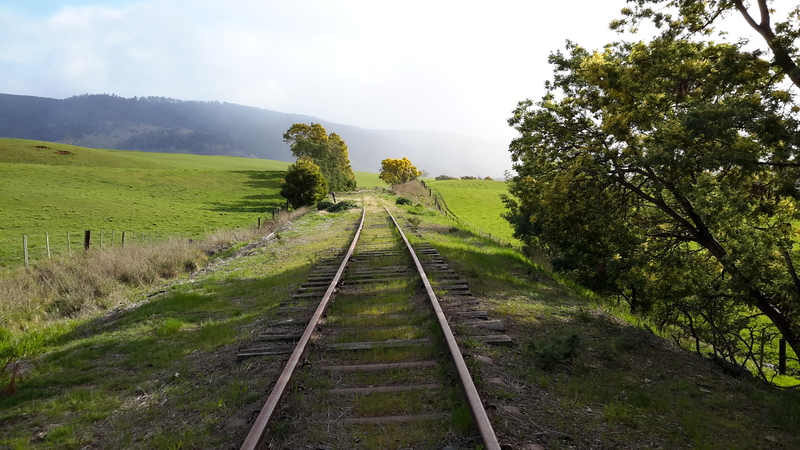 First and last I walked on main roads but in between I often had no alternative but to walk on the variously rotting sleepers of an unused railway line. 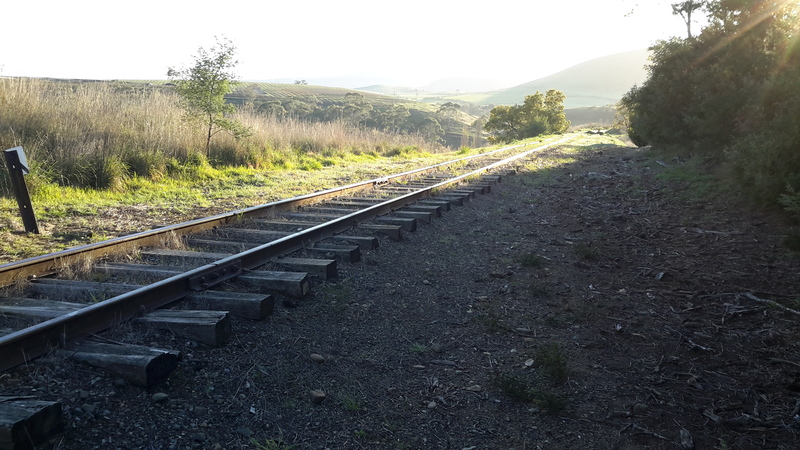 I couldn’t create a walking rhythm: the sleepers were irregularly spaced and irregularly sized and the spaces between each were filled with rocks, gravel, dirt or grass and weeds. Sometimes there was no fill. 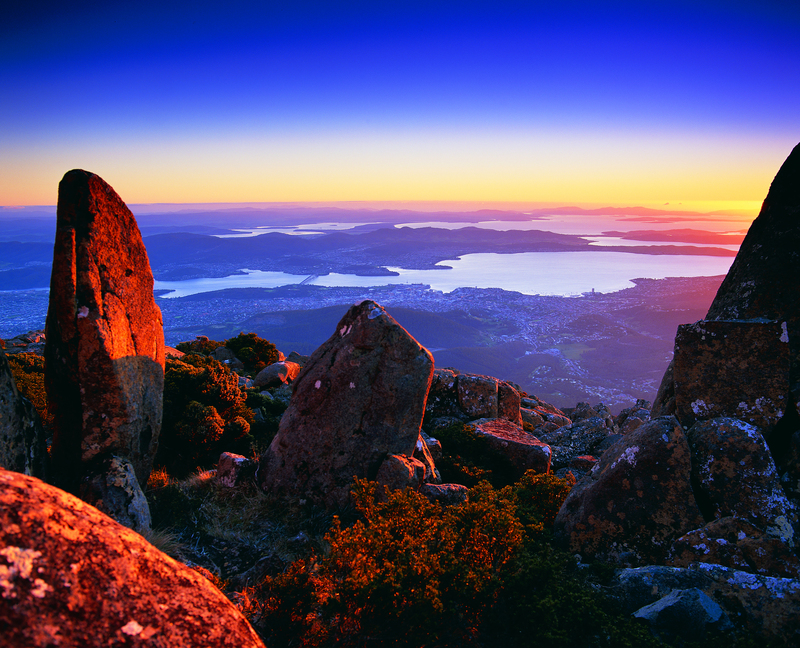 In this region, the railway line runs on the northern/eastern shore and then, about two thirds of the way from New Norfolk west to the district of Plenty, it makes a diagonal line crossing the Derwent River. 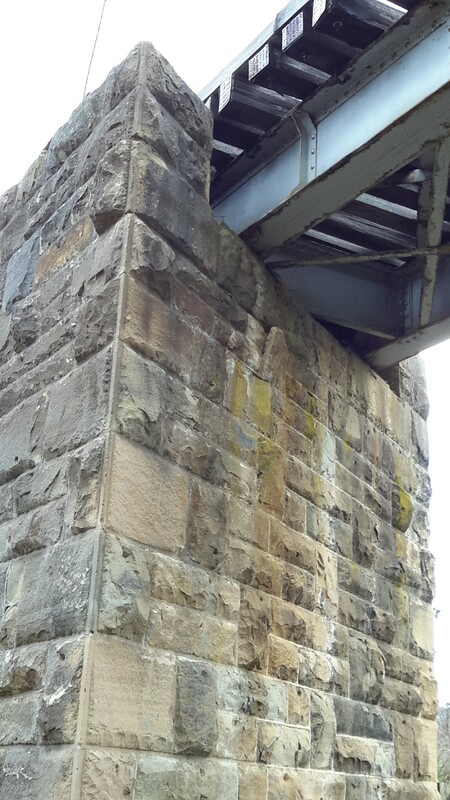 I met the railway on the southern/western side and was able to walk under the old sandstone supports on the river bank before proceeding westwards by following the river closely. 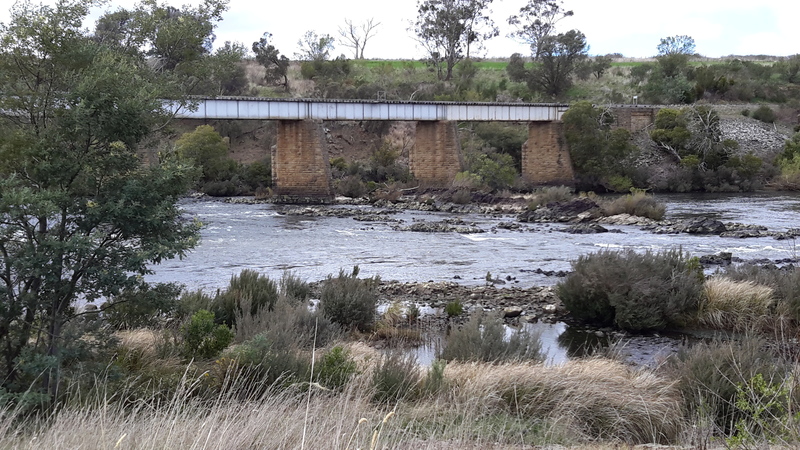 Later I reached the railway bridge over the Plenty River, where a quick reconnaissance indicated some sleepers were missing and others looked suspiciously like they might disintegrate under weight. My weight. For 30 seconds I thought about whether to cross the bridge. I decided that walking on the metal rail track could be safe enough for those experienced with walking on gymnastic balance equipment, but not for those carrying a backpack, nor those easily thrown by sporadic wind gusts. 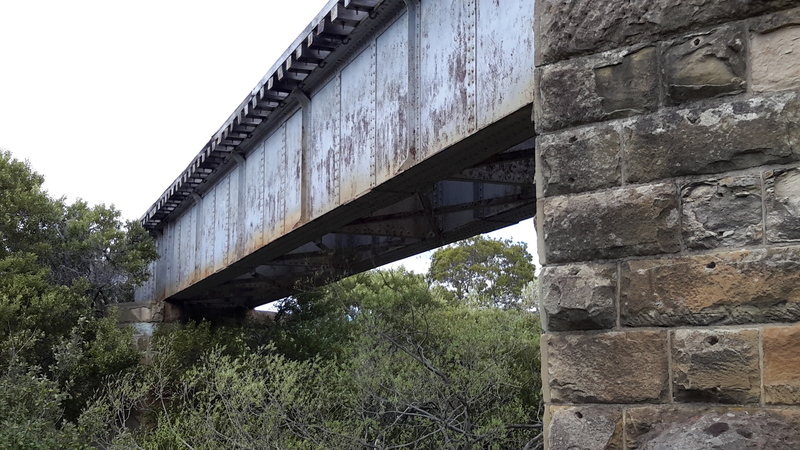 Instead I detoured onto Glenora Road crossed the road bridge and then made my way off the road and back to the railway line. Thick impenetrable vegetation prevented me from walking closer to the river so I stayed on the railway line for many kilometres, with an occasional foray closer to the river. 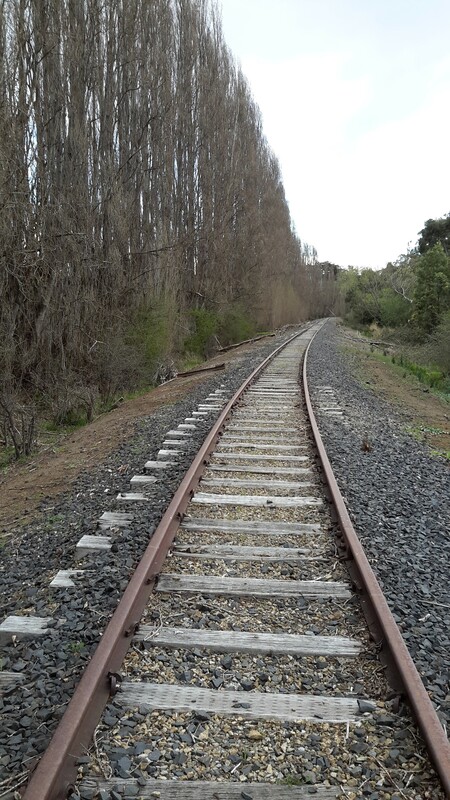 However, mostly I found it impossible to proceed and returned to walk on the railway line. This railway line walk should be a stunning place in autumn especially where rows of well-established poplar trees marked the edges. I know the leaves of poplars turn gloriously yellow after summer. Towards the end of day one of Stage 15, an impending rainstorm seen at the end of one stretch of line prompted me to look for a suitable campsite. A while later I pitched my tent beside the line. Next morning the sun was shining, despite very low temperatures, and the glorious views lifted my spirits. I received a text from blog follower Ju that Rail Track Riders http://www.greatrailexperiencestasmania.com.au/event/rail-track-riders/?instance_id=485844 would be in motion along the line during the day. What I surprise for them it would have been to find my tent on the side of the line – but I was well gone before I suspect there was a movement at any station back up the track. 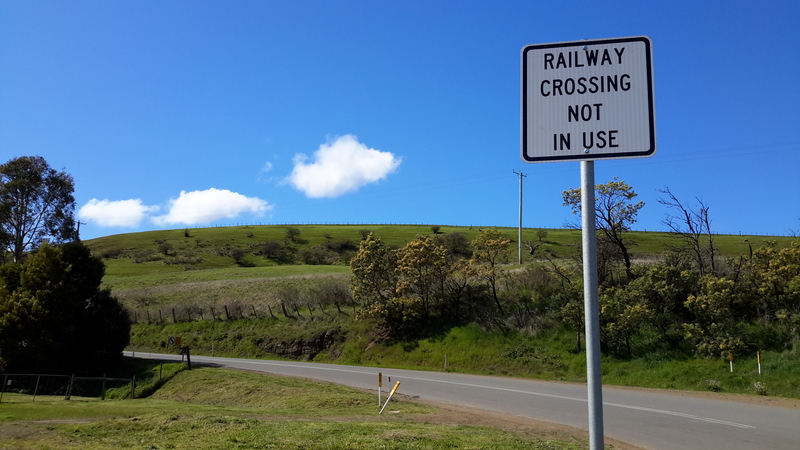 After Bushy Park and en route to Gretna I saw my first railway sign when the track crossed the road. 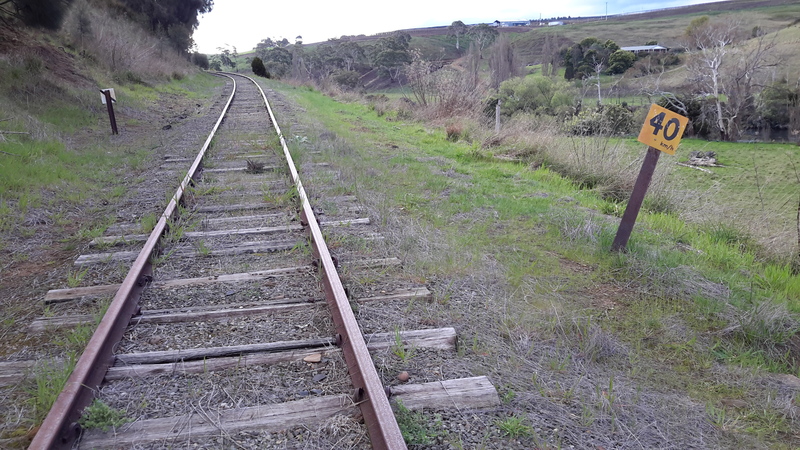 Looking back, clearly no railway vehicles had travelled this way in a long time. 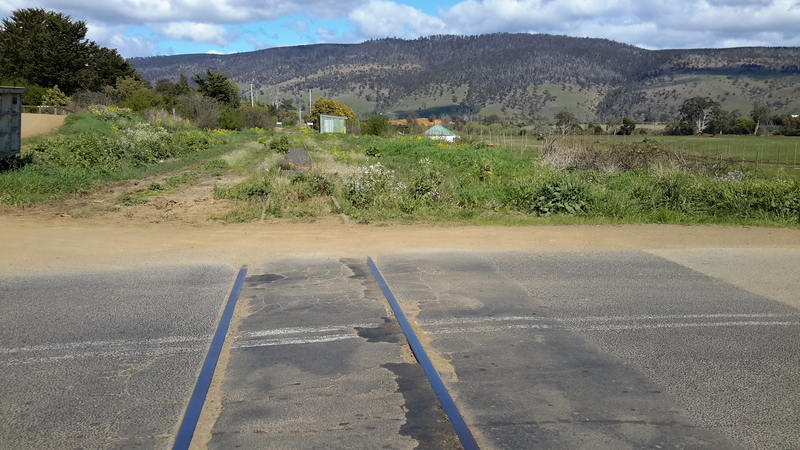 Now cyclists and governments are discussing ways in which to turn this old railway track into a cycling corridor. 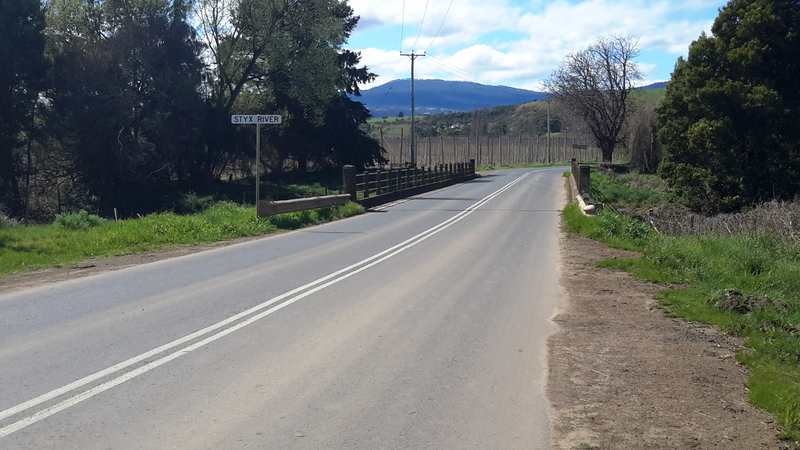 But no one is talking about edging closer to the Derwent River. 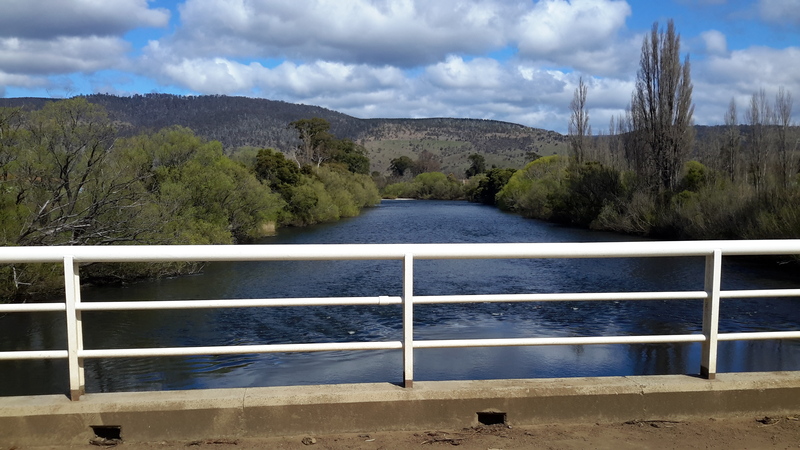 This entry was posted in Derwent River, Tasmania, Walking and tagged Bridgewater, Bushy Park, cycling, cyclists, Derwent River, Glenora Road, Gretna, Lichen, New Norfolk, Plenty, Plenty River, poplar, Rail Track Riders, railway, recreation, rest, Roads, Styx River on September 22, 2015 by Tasmanian traveller. 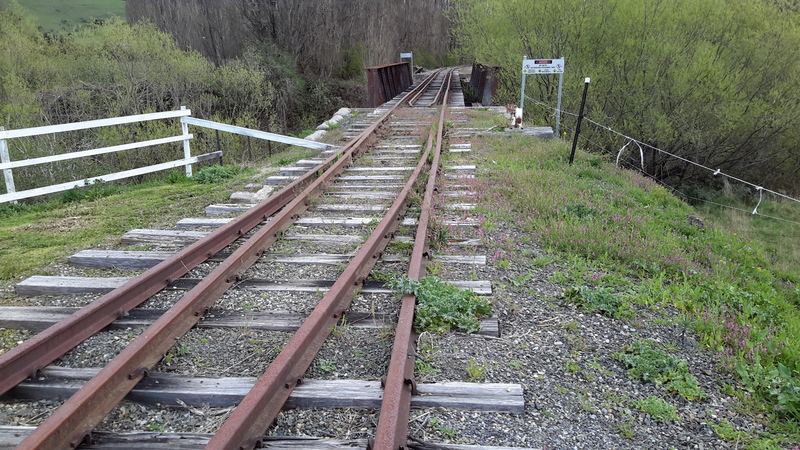 There is much movement here in NY to turn old railroad lines into trails in the Catskill Mountains. The good news is most of the converted lines have been made into accessible trails, which make it easier for me to get out and enjoy the environment. It does make sense to modify already existing ‘pathways’because the cost is considerably less than starting from scratch. 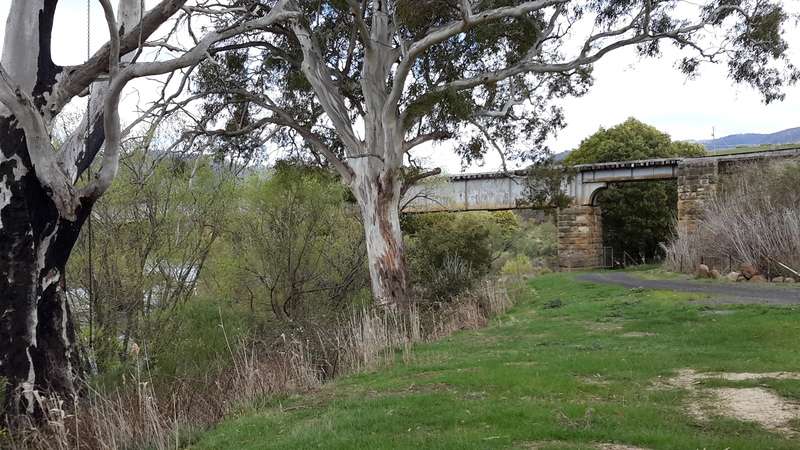 If the Derwent Valley’s rail tracks become cycling tracks that also means they are fine for walking … but whether they are fine for people using all sorts of equipment such as wheel chairs???? I wonder whether they will think of that. I would like to think so. 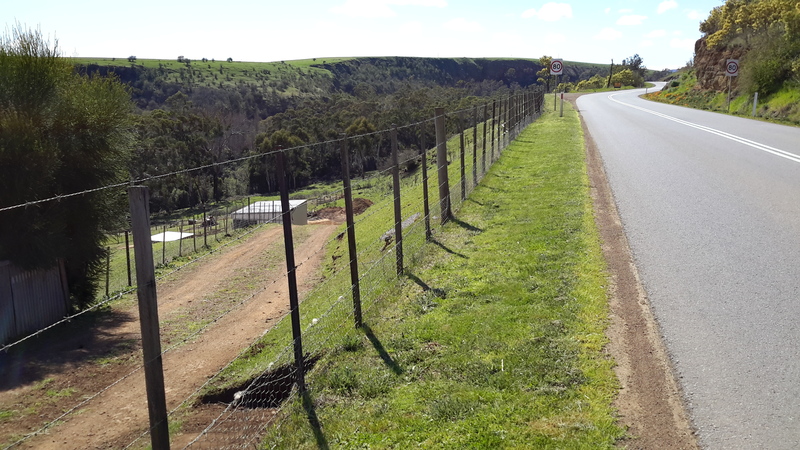 Nevertheless there will be lots of impediments put in the way by farmers first before I imagine anything will proceed down here – seriously opening up the track will make access to their farms that bit easier which will worry them from a security point of view. And the railway corridor is out of sight mostly at night so rustlers and hustlers could use it with abandon. It’s a complex situation for sure.